Last summer I journeyed to Amsterdam to visit the world’s largest handbag museum, Tassenmuseum Hendrikje. 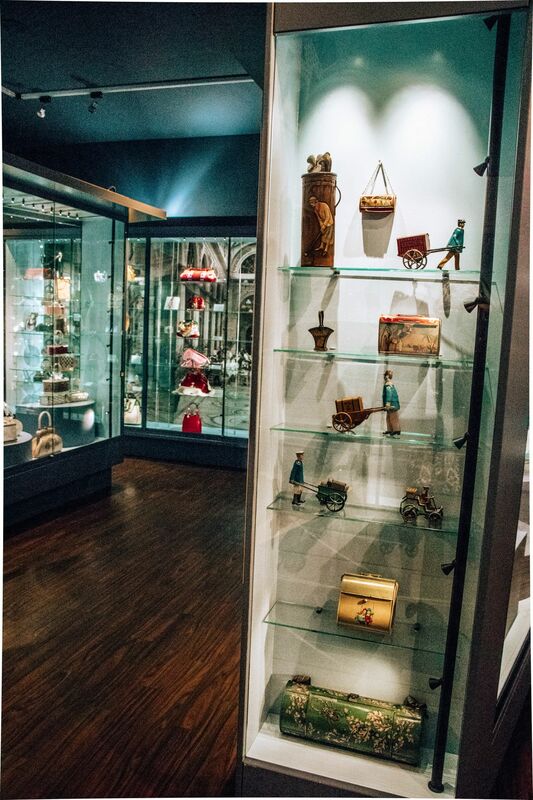 The museum originated with the personal handbag collection of Hendrikje and Heinz Ivo. In 1996, the couple put their unique handbags on display in their home in Amstelveen and opened it to anyone who admired them. The collection eventually required more space and was relocated to a seventeenth century canal house in Amsterdam. There are currently over five thousand pieces on display, including historical and celebrity bags, clothing, and fashion accessories. The oldest bag in the museum dates back to the sixteenth century and was originally designed for a man. Constructed of goatskin, it contains eighteen compartments- some of which are secret. During my visit, there was a fascinating art exhibit of bag concepts created by students from the Royal Academy of Art in The Hague. The students were asked to design what they thought handbags would look like in the future. When I first heard about this exhibit and contemplated the idea, my imagination carried me to visions of a briefcase-style drone bag flying alongside of me, lightening my heavy load. The exhibit was quite different than what I had imagined. In their designs, the students had carefully considered the earth’s shortage of raw materials and global water scarcity. Popular themes included multi-functional bags and bags with removable parts made from three dimensional printers. One especially interesting idea on display was the “Bag as a Home”. This innovative bag would be able to filter enough urine to produce a day’s worth of drinking water. When in Amsterdam, be sure to check out this iconic fashion museum. Enjoy elegant high tea in the charming and historical canal house, stroll through the serene outdoor gardens, and shop for luxury designer bags and accessories in the boutique. Learn how bags have shaped our culture from the earliest of times, and catch a glimpse into their future evolution. A visit to Tassenmuseum Hendrikje is informative, thought-provoking, and a must-see for handbag enthusiasts.